Detroit Lake, Minn. • It’s 7:30 in the morning, and Tanner Smedley has already been up for an hour. He’s eaten, prayed twice and exercised. He belts on his black slacks, one of six nearly identical pairs in his closet. He irons a white button-down — one of 12 — and then he gets to choose a tie. "By the end of your mission, you go home with a whole bunch of ties," he said, "because ties are the only way you can show any character." Smedley is 19. He’s from Utah. And he’s six months into his two-year Mormon mission. 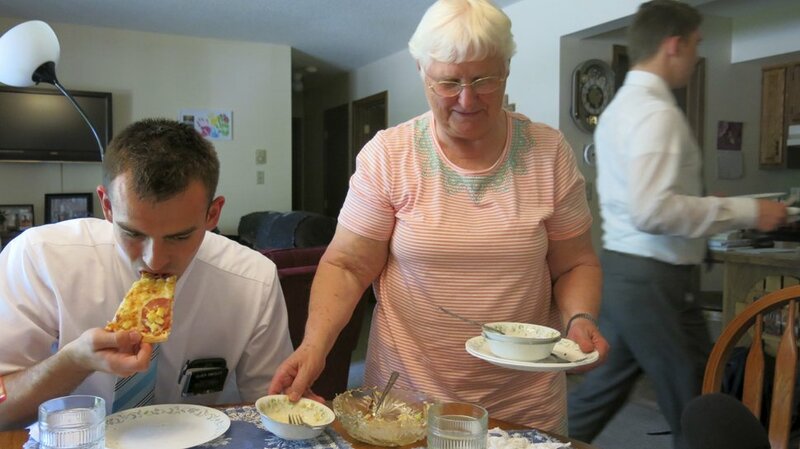 He’s spent most of that mission assigned to Detroit Lakes, Minn.
About 70,000 Mormon missionaries are scattered across the world — about a third of all Mormons between the ages of 18 and 26 — and every single one has the same morning routine as Smedley. It’s mandated by the church. He puts his name tag in his front pocket. Behind it, he keeps what's known as the "White Handbook." The handbook is slim, and the print is tiny. There are a lot of rules: no girlfriends. No swearing. No music that’s not the Mormon Tabernacle Choir. No calls home, except on Christmas and Mother’s Day. And there's another rule. Smedley isn't allowed to be alone for long stretches. Mormon missionaries are sent out in pairs to keep each other on the straight and narrow. Smedley’s companion, Joseph Smith, is also 19 — and from Utah. He shares a name with the founder of the Mormon church, though the coincidence, he said, was sort of an accident. His mother remarried when he was young and, for the first year after, he resisted changing his last name to match her new one. "I was like, no way am I ever changing my last name," Smith said. "I don't need that kind of teasing in my life." Mormon missionaries are probably best known for the door-knocking at the root of their work, but it doesn’t take up their entire day. They spend a lot of time studying the Bible, praying and scheduling meetings with people who are interested in learning about The Church of Jesus Christ of Latter-day Saints. (John Enger | Minnesota Public Radio) In this June 13, 2018 photo, Reva Husby, known as a mission grandma, Tanner Smedley, left, and Joseph Smith in Detroit Lakes, Minn. Husby whos not Mormon, and not even interested in becoming one, says she likes taking care of the missionaries. Smedley and Smith, both 19 from Utah, are part way through into their two-year Mormon mission. They have spent most of that mission assigned to Detroit Lakes. Smith and Smedley’s first appointment of the day is with a woman named Reva Husby, for lunch. Husby isn’t Mormon. And she’s not considering a conversion. She’s Methodist but likes the company. She’s become something of a surrogate grandmother to 10 years' worth of Mormon missionaries in Detroit Lakes. "You know, they get a bad rap," she said, "because people won't sit down and talk to them. They think these terrible Mormon missionaries are going to jerk them into the church, and that's just not true." By 2 p.m., the missionaries are finished with lunch, and more prayer, and it's time for some door-knocking. They know it might take a while to find someone who's interested in Mormonism. This part of their work doesn't have a quick payoff. There's nobody home at the first house, or the second. Or the third. Then they reach an apartment building by the highway. They find the door of a man who they talked to a few days earlier. "Not now, but maybe later," he'd told them. They knock, and wait. It's quiet, but the door moves a little bit. There's obviously someone right on the other side, squinting through the peephole, but he doesn't answer the door. Finally, they just leave. That’s a common response, Smith said. He once saw a woman hiding but clearly visible through a picture window. "She was just under the table," he said. "We could see her. We got the message that she wasn't interested." By door 20, the pair’s energy is running low. Only a handful of people have been home. One woman said she had a migraine but that they could come back later. One elderly man said a version of the same thing, and that’s the best they’ve encountered. They begin to head back to their apartment. 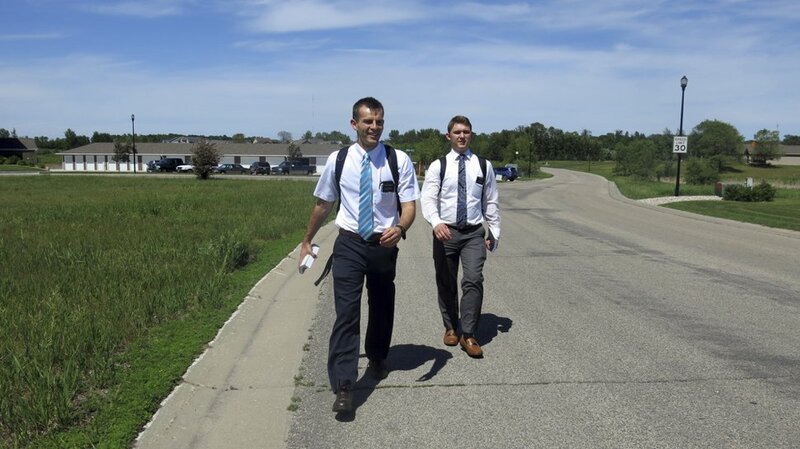 (John Enger | Minnesota Public Radio) In this June 13, 2018 photo, Tanner Smedley and Joseph Smith head into Detroit Lakes, Minn., on foot for an afternoon of door knocking in Detroit Lake, Minn. Smedley and Smith both 19 from Utah, are part way through into their two-year Mormon mission. They have spent most of that mission assigned to Detroit Lakes. Here’s how the day breaks down: The missionaries knocked on a little more than 20 doors. Only two people said they could come back later. Of that group — the “come back later” people — Smedley said an average of 1 in 10 becomes something he calls an “investigator.” Those are the people who receive multiple lessons on the Mormon faith. And roughly 1 out of 30 investigators follows through and is baptized into the church. So if the day is average — and, according to Darrell Stacey, the former president of the Bismarck, N.D., Mormon mission office, it is average — to bring a single person into the Mormon church, missionaries have to knock on 3,000 doors. That's a lot of doors, with precious little encouragement. They can't unwind with some Netflix, or call their moms. What keeps them going is simple, Smith said. They believe. And their missions work makes their faith even stronger. According to University of Minnesota anthropology professor David Lipset, that might be the whole point. The years young Mormons spend in the mission field, he said, have a lot in common with initiation rites going back through thousands of years of culture and history: They're separated from their families. They follow strict rules. They do difficult work, and the ordeal embeds them in the church forever. By that logic, Lipset said, wearing the dark slacks and the nametags, and getting rejected over and over, might be just as important to the Mormon church as recruiting new members. The missionaries decide to stop at one last house before calling it a night. They've talked to the owner once before; she was a little intrigued the first time. But when they return for a second visit, she's visibly excited to learn more about the Mormon church. They set up a teaching appointment for the following weekend. By the end of the day, Smith and Smedley have walked miles — but one woman is a step closer to the faith. She might eventually convert, though statistically, it's rare. But she has an appointment, and that’s good enough for the missionaries.